That unicorn is so eye-catching! If watercolor tattoos are soft, delicate designs, neon tattoos are her bold and vibrant sister. Both use color to draw gorgeous designs, but the end results could not be more different. And while we're sure the watercolor tatt trend isn't going anywhere, neon ink is your best bet if you're looking to get something different. ;) They're created by layering white or black ink over a brightly-colored design to give it a 3D effect! Unsure about what neon tattoo to get? Keep scrolling! We love the contrast between the black background and neon clouds, moon, and stars! Take your aqua lightning bolt up a notch by adding black on the sides to make it pop. In case you were wondering what neon cloud puffs would look like, this is it! Know someone who loves unicorns? 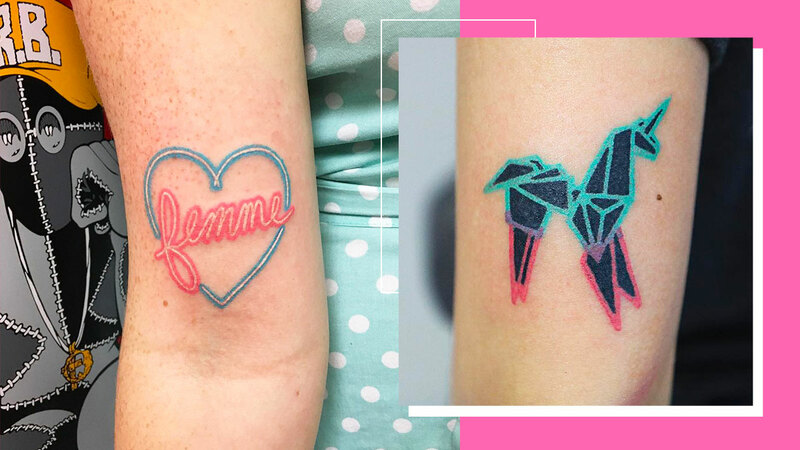 This origami neon tatt is for them! Hearts intertwined with words and letters are popular, too.